Liang, C., Hu, Y., Guo, L., Wu, L., and Zhang, W. (2017). "Kinetic study of acid hydrolysis of corncobs to levulinic acid," BioRes. 12(2), 4049-4061. Levulinic acid (LA) is an important platform compound that can be obtained from biomass resources. Using corncobs as the raw material that had already removed the hemicellulose, this work studied the relevant hydrolysis kinetics. 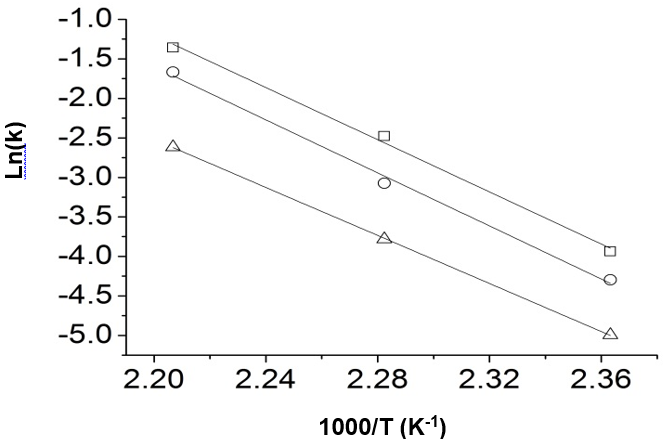 The kinetic experiments were performed at various temperatures in the range of 150 °C to 180 °C and sulfuric acid concentrations between 0.2 mol/L and 0.8 mol/L in a reactor designed by the authors. The highest yield of LA was obtained at 150 °C and 0.8 mol/L H2SO4 at 58.0 mol%. A new simple kinetic model that consists of four first-order reactions was proposed; the model assumes that humins can be only converted from 5-hydroxymethylfurfural (5-HMF). A modified parameter fitting method that contained equality constraints and a weighted objective function was applied in this study. The kinetic model was in excellent agreement with the experimental data. Biomass is renewable, widely available, and an environmentally friendly resource. Increasing environmental pressures and the growing shortage of fossil fuels have increased people’s focus towards the use of biomass resources. Fuel and chemical products can be obtained from different biomass resources: Bio-alcohol can be obtained by fermentation of cellulose or starch (Lin and Tanaka 2006); xylose and furfural can be obtained from the hydrolysis of hemicellulose (Mamman et al. 2008; Rafiqul et al. 2014); bio-oil can be produced from the pyrolysis of biomass resources such as wood (Mohan et al. 2006); and bio-gas also can be obtained by the anaerobic fermentation of biomass (Weiland 2010). Levulinic acid is an important platform compound that can be converted from cellulose, and it has many applications (Rackemann and Doherty 2011). The use of inexpensive biomass resources for the production of fuels or chemical products, such as levulinic acid, is important to sustainable development (Yang et al. 2010). At the end of the last century, Biofine (Biofine Incorporated is the assignee of this patent) company used a two-step hydrolysis method with dilute acid and carbohydrate-containing materials, such as a slurry of paper materials, to produce LA (Fitzpatrick 1997). With over 70% yield of LA, the company had applied this technology to start a small-scale industrial production. Later, many studies were conducted on the hydrolysis of various biomass feedstocks, and LA could be produced from grain sorghum, wheat straw, water hyacinth plant, paddy straw, sugarcane bagasse, and corn stalk (Fang and Hanna 2002; Chang et al. 2007; Girisuta et al. 2008; Yan et al. 2008; Girisuta et al. 2013; Zhi et al. 2015). Saeman’s model described the reaction of cellulose to glucose and glucose to decomposition. The model also took the effect of acid concentration in the hydrolysis reaction into consideration. However, a detailed transformation process of levulinic acid or humins was not described in that study. On the basis of the Saeman model, a more detailed reaction mechanism of LA formation from cellulose through glucose and 5-HMF was proposed by Girisuta and co-workers (Girisuta et al. 2007). The by-product reactions to humins were also proposed in the study, and it was assumed that humins could be converted from cellulose, glucose, and 5-HMF, respectively. Girisuta et al. (2008) applied this model to the hydrolysis of water hyacinth. 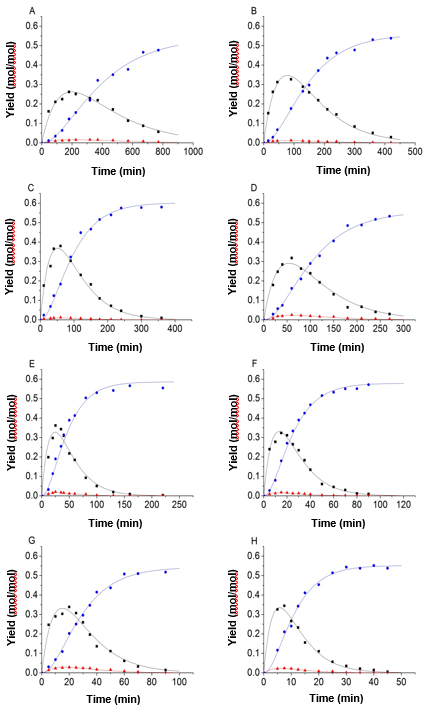 Chang and co-workers studied the hydrolysis of wheat straw and considered the relevant kinetic model (Chang et al. 2009). The mechanism of LA formation was consistent with the model proposed by Girisuta. But for the by-product humins, they assumed that cellulose could not be directly converted to humins. 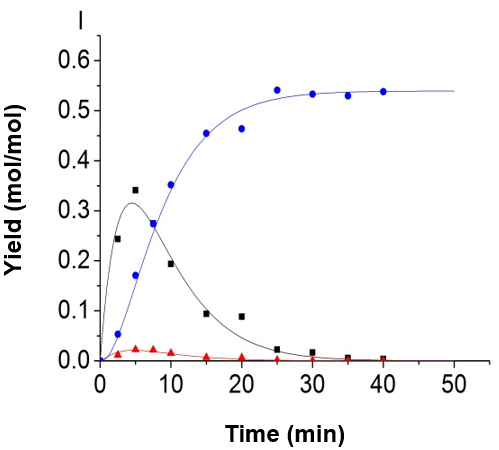 Shen and Wyman (2012) conducted a kinetic study on the hydrolysis of cellulose with hydrochloric acid as a catalyst, and they measured the change of cellulose concentration with time in the course of the experiment. The model was verified by accounting for all of the reaction participants. For the formation mechanism of LA and by-product humins, the hypothesis of Shen was consistent with the hypothesis of Chang. However, the LA was not considered to be the final product of the reaction in their study and would be further decomposed. Girisuta, Dussan, and co-workers used bagasse as the starting material in the batch reactor for the hydrolysis reaction (Girisuta et al. 2013). Compared with the earlier studies of Girisuta, a simpler kinetic model was proposed. The model assumed that humins was produced directly by glucose conversion. The cellulose and the intermediate 5-HMF were assumed not to be directly involved in the formation of humins. Corn is a widely cultivated crop with an enormous yield. In China, corn yield was up to 215 million tons in 2013 alone (Du et al. 2015). Corncobs, as the composition of corn, also have a high yield. However, most of the corncobs are not well utilized, but abandoned. Even in the furfural industry and the xylitol industry, the corncobs are not completely utilized. The residue also contains a lot of cellulose, and these resources are not well used. The present work used corncobs, from which the hemicellulose already had been removed, as the raw material to study the relevant hydrolysis kinetics. The authors’ objectives were: (1) to obtain the hydrolysis experimental data at various temperatures in the range of 150 °C to 180 °C and acid concentrations between 0.2 mol/L to 0.8 mol/L; (2) to put forward a corresponding kinetic model and use the experimental data to fit the model parameters; (3) to optimize the fitting process of the kinetic model; and (4) to apply the model to identify promising strategies to enhance LA yield. The following materials were used in this study: Corncobs (30-mesh, Local farm, Qingdao, China), sulfuric acid (98%, Aladdin, Shanghai, China), deionized water, levulinic acid (Aladdin, Shanghai, China), glucose (Aladdin, Shanghai, China), and 5-HMF (Aladdin, Shanghai, China). The corncobs were processed by a 3.5% sulfuric acid solution under the conditions of 100 °C and a solid-to-liquid ratio of 1:10 with 3 h. The purpose of this operation was to remove the hemicellulose from corncobs as much as possible. Then, the filtrate was filtered and the residue was washed twice with sufficient deionized water. Finally, the residue was dried in a vacuum oven (DZF-6050, Hecheng Instrument Manufacturing Inc., Shanghai, China), and then crushed to 70-mesh using a pulverizer (XFB-400, Zhongyao Machinery Inc., Changsha, China). The hydrolysis reactions were performed in a 500 mL reactor designed by the authors (Fig. 1). The reactor was equipped with a catalyst injection device. The catalyst injection device was constituted by a feeding tank, a communication valve, and a feeding valve. 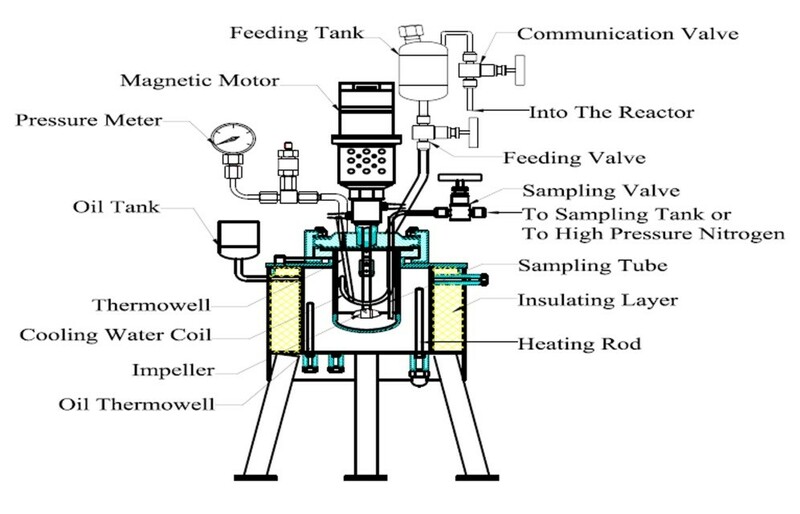 The communication valve and the feeding valve were in communication with the interior of the reactor. The catalyst injection device and the reactor internal material was Hastelloy C-276 (Huanyu Chemical Machinery Inc., Weihai, China), which could effectively resist corrosion by the sulfuric acid solution. The reactor could meet the experimental requirements for the catalyst injection and the sampling of the reaction mixture. Before the start of the reaction, all valves were closed, the corncobs residue (40 g) was added to the reactor, and a corresponding amount of deionized water was also added. The sulfuric acid (98%, analytical pure) was then added to the feeding tank. The amount of catalyst and deionized water was calculated according to the experimental requirements to ensure that the solid-to-liquid ratio of the corncobs residue to sulfuric acid solution was 1:10. After loading the material, the communication valve was opened, and the high purity nitrogen gas was injected into the reactor from the intake valve (due to the viewing angle, the intake valve and air release valve are not shown in Fig. 1). When the nitrogen pressure in the reactor was equal to the saturated vapor pressure of the target temperature, the nitrogen gas injection was stopped. The communication valve and intake valve were closed to maintain the pressure of the feeding tank, and then the air release valve was opened. After exhausting the gas in the reactor, all of the valves were closed. The reactor was heated using an external oil bath, and the stirring speed of the reactor was set at 500 rpm. A thermocouple probe inside the reactor was connected to a digital temperature indicator, with accuracy capabilities of ± 0.5 °C. There was no reaction during the heating process. When the temperature inside the reactor had reached the desired set point, the communication valve and the feeding valve were opened at the same time and sulfuric acid was injected into the mixture of corncobs residue and deionized water. The time of catalyst injection was recorded as time “zero.” As the reaction progressed, the samples at each reaction time point were removed through a sampling tube. Before sampling, high-pressure nitrogen gas was injected into the reactor through the sampling tube to clean the tube. After sampling, the nitrogen was also needed to clean the sampling tube. The samples were filtered through a 0.45-μm syringe filter. After being diluted, the components in the samples were determined by the chromatography systems. The glucose, 5-HMF, and LA contents in the solution were analyzed by HPLC (L-2000, Hitachi Limited, Tokyo, Japan) with a refractive index detector with an Aminex HPX-87H column (300 mm × 7.8 mm, Bio-Rad, Hercules, USA). The mobile phase was an aqueous solution of sulfuric acid (0.005 mol/L), and the flow rate was 0.55 mL/min. The column temperature was set at 60 °C, and the temperature of the refractive index detector was set at 38 °C. The standard curve was plotted first by using the chromatographic pure chemical, and the concentration of each component in the samples was then measured by a standard curve. The analyses of the original corncobs and corncobs residue (pretreated) are given in Table 1 and Table 2. The cellulose hydrolysis process is a complex chemical reaction process in which the detailed reaction mechanism has not been fully understood, especially in the humins conversion process. Thus it is worthy of further study. Patil et al. (2012) put forward a pathway for humins formation from cellulose. They proposed that humins were mainly derived from the aldol addition/condensation of 2,5-dioxo-6-hydroxyhexanal, which was converted from 5-HMF with aldehydes and ketones. The direct conversion of cellulose, from glucose to humins, was not obvious. Van and co-workers (2013) revealed that the humins were formed by a dehydration pathway that the furanic structure reacted with alcohol, acid, ketone, and aldehyde functional groups, and revealed that humins were mainly derived from 5-HMF. Although the mechanisms for the formation of humins were different, the above two studies agreed that humins were mainly derived from 5-HMF. Based on the studies of Patil et al. (2012) and Van et al. (2013), the authors researched the simplified kinetic model of the hydrolysis reaction and made the following assumptions: (1) the model consisted of four consecutive reactions, all of which were defined as first-order reactions; (2) cellulose was hydrolyzed to glucose, and then glucose was decomposed to form 5-HMF; once 5-HMF was generated, it quickly converted into the final product levulinic acid and by-product humins; (3) humins were only converted by 5-HMF, and cellulose and glucose were not directly involved in the conversion of humins; (4) all of the unknown products were humins. The humins were generated from 5-HMF and it would be further polymerized to form macromolecular humins. Based on these assumptions, the proposed reaction model is shown in Fig. 2.
where, A0,i is the frequency factor, mi is the reaction order in acid, Ei is the activation energy (J/mol), and R is the ideal gas constant (J/(K·mol)). In this reaction, the temperature and acidity were taken as independent variables. The three acid concentrations of 0.2 mol/L, 0.5 mol/L, and 0.8 mol/L sulfuric acid solution were selected at the temperatures of 150 °C, 165 °C, and 180 °C, respectively. Thus, 9 sets of experimental data were obtained. Equations 6 through 10 with initial conditions where C = C0 and G = HMF = LA = 0 at time=0 were used to fit the experimental data, and the kinetic parameters were determined using the First Optimization (Version 6.0, 7D-Soft High Technology Inc., Beijing, China) software tool. where j is the node of the experimental data vs. time and pre is the predicted value. 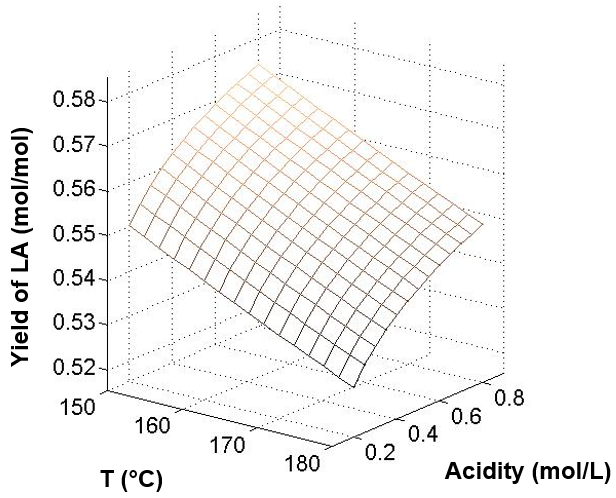 Figure 3 shows the experimental and predicted data under the conditions of 150 °C, and 0.8 mol/L sulfuric acid solution, with the equality constraint added in the process of fitting. However, it was found that the results were not ideal. The error between the experimental values and the fitted values of 5-HMF was large. According to the analysis, the authors found that the concentration of 5-HMF was too small when compared with the glucose and LA, and had a relatively small impact for the objective function. So the objective function was improved, and the value of 5-HMF was weighted. Figure 4 shows that the accuracy of the fitting results was clearly improved when the equality constraint and improved objective function were applied in the process of fitting. Using the parameter fitting method, 9 sets of experimental data and predicted data calculated from the kinetic model were obtained and shown in Fig. 5. From the slope of the straight lines, the activation energy can be obtained. Figure 6 shows the Arrhenius plots of the reaction of glucose dehydration to produce 5-HMF. Three straight lines corresponded to the three acidities, respectively. The activation energy was finally obtained by the average value of the slope of the three straight lines. Other kinetics parameters could be further solved and are shown in Table 3. In this study, the maximum yield of LA was obtained at 150 °C and 0.8 mol/L H2SO4 at 58.0 mol%. At the same acidity, the LA yield was 57.2 mol% at 165 °C and 53.8 mol% at 180 °C, respectively. A similar situation could be obtained at the other two acidities. The LA yield decreased with increased reaction temperature. A relatively low temperature favored the selectivity of LA. For the influence of acidity, high concentrations of acid were advantageous for the production of LA. At a temperature of 165 °C, the LA yields were 53.3 mol% at 0.2 mol/L H2SO4, 55.4 mol% at 0.5 mol/L H2SO4, and 57.2 mol% at 0.8 mol/L H2SO4. The same situation also could be obtained from the temperature of 150 °C and 180 °C. Thus, relatively low temperatures and high acids were beneficial to the LA yield. This result was also consistent with the results of Girisuta (2007). Figure 7 shows the calculated LA yield according to the kinetics parameters of this study. The authors made use of the model proposed by Girisuta et al. 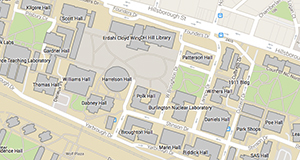 (2013) by associating the current experimental data. The model proposed by Girisuta and co-workers also contained four consecutive first-order reactions. The model assumed that the humins was produced directly by a glucose conversion. The cellulose and the intermediate 5-HMF were not directly involved in the formation of humins. It was found that the fitting results were also fitted well by using their model and the authors’ modified parameter fitting method. Part of the fitting results is shown in Fig. 8. Because the reaction of 5-HMF to LA and humins is very fast, the concentration of 5-HMF and glucose have synergistic effects, so a good data fitting can be achieved with both models. The model in Chang’s study was also applied to associate the experimental data (Chang et al. 2009). In their model, the mechanism of LA formation was consistent with this study. However, for the by-product humins, their model assumed that the humins could be directly converted from glucose and 5-HMF. Because the model has two generation paths to humins, the program may produce multiple situations in the process of searching for the optimal solution, from a mathematical standpoint. As shown in Table 4, at the condition of 150 °C and 0.8 mol/L sulfuric acid solution, humins were completely produced by 5-HMF; however, at the condition of 150 °C and 0.2 mol/L sulfuric acid solution, humins were generated by the glucose and 5-HMF together. Corncobs-Glu is the reaction of corncobs to glucose, Glu-5-HMF is the reaction of glucose to 5-HMF, Glu-Humins is the reaction of glucose to humins, 5-HMF-LA is the reaction of 5-HMF to LA, 5-HMF-Humins is the reaction of 5-HMF to humins. Compared with the above two models, it was found that the model that had several generation paths to produce humins could easily produce multiple situations in the fitting process. The simplified kinetic model that had only one-generation path to humins could avoid this problem. It was not the only model that could describe the corncob hydrolysis. Both the model in this study and the model proposed by Girisuta and co-workers (2013) could fit the experimental data very well by using the modified parameter fitting method. However, according to the studies of Patil et al. (2012) and Van et al. (2013) about humins, the model in the present study should be more reasonable. This study used extracted corncobs, which already had the hemicellulose removed from them, to determine the kinetics experimental data of corncobs to LA. The data was obtained in the temperature range of 150 °C to 180 °C and an acid concentration range of 0.2 mol/L to 0.8 mol/L. The maximum yield of LA was obtained at 150 °C and 0.8 mol/L H2SO4 at 58.0 mol%. Based on the study of Patil (2012) and Van (2013), the mechanism of the formation of humins, the authors proposed the kinetic model that contained four consecutive irreversible first-order reactions under the assumption that humins could be only converted by 5-HMF. A very good fit was observed between the experimental data and the kinetic model. A modified parameter fitting method was applied in this study. An equality constraint was added in the process of fitting, which made the process more reasonable. Meanwhile, the objective function was improved and the value of 5-HMF was weighted. The accuracy of fitting results was clearly improved compared with the default objective function. This work was financially supported by the Nature Science Foundation of China (21376231). Fitzpatrick, S. W. (1997). “Production of levulinic acid from carbohydrate-containing materials,” U.S. Patent No. 5608105. Article submitted: January 25, 2017; Peer review completed: March 30, 2017; Revised version received and accepted: April 13, 2017; Published: April 20, 2017.